I tried both varieties of this new cereal: Oats 'N Honey and Cinnamon. First the good news: If you're into snacking on dry cereal right from the box, you have to try these. They are flavorful and fun. The lightly-sweetened multi-grain flakes will remind you of other cereals, but the "Granola Bar Pieces" (one or two per small handful) make both of these cereals special (when eaten dry). I was surprised that the pentagon-shaped granola pieces gave me the same kick as getting the occasional marshmallow or chocolate piece in other cereals. I would buy these cereals again in a second for the purpose of dry-snacking. As for which is better - Oats 'N Honey or Cinnamon, it's strictly a matter of taste. I may have liked Oats 'N Honey a touch better, just because it reminded more of the Nature Valley Granola bars I grew up with. Now for the bad news: Both cereals loose a little bit of their magic when milk is added. The cinnamon variety fares a little better because the milk takes on some of the cinnamon flavor. The flakes stay moderately crunchy and retain most of their flavor. The problem is with the granola pieces. Their texture in milk feels confused: not quite crunchy, not quite soggy. When eaten with the still-crunchy flakes, the granola pieces (that were so good dry) suddenly seem like what it must be like to eat small cakes of saw dust. I was hopeful that this was just the impression of the first few bites, but the more I ate of the bowl, the more the granola pieces seemed out of place. The nutritional profiles of these new cereals are nothing to get excited about - despite the "100% Natural" exclamations and the waving stalks of wheat on the boxes. Each 1 cup serving (without milk) for both varieties has 230 calories, 3 grams of fat (none of which are dreaded Trans Fat) and 48 grams of carbs. The splattering of vitamins is very low compared to many other cereals. Only iron appears on that part of the panel, showing up at 4% of the recommended daily value. I'm giving these cereals a perfect 7 for dry snacking. They get 3 and 1/2 when you add milk. I'm taking away one golden egg for looking more healthy than they actually are. That all equates to a high 4 according my strange math. And that's not too bad. If you're in the mood try a new cereal, go for it. You'll finish the boxes one way or another. 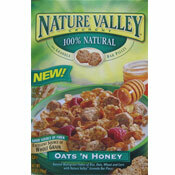 What do you think of Nature Valley Crunchy Cereals? This is a great cereal. I particularly like pumpkin flax granola & pumpkin raisan crunch w/flax. I cannot find the latter & still buy the former. Am sickened 2 hear its discontinued. 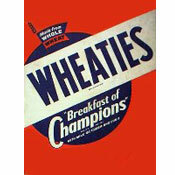 Why not discontinue choco whatever frosty flakes instead of this great cereal... Bring it back. Pretty please. This cereal tasted bad with or without milk. I'm glad it was discontinued. I am upset. I have been trying to find out where to purchase this cereal. I absolutely loved it. Please help! I just talked to General Mills, this cereal is from the food service line, not available in stores and has been discontinued. We are so sad!! I agree with everyone on this website about how good it is. I also can not find it anywhere. I do not see any answers posted as to why. Help? Were can I buy this? I can't find it anywhere. I wish I could find this cereal in my area grocery store. What happened to my favorite cereal? I agree with C. Man... I LOVED this cereal and when I noticed it had "disco" tags at the grocery stores I bought all the boxes that were left (at multiple stores)... I haven't found anything comparable but have come to the upsetting conclusion that it is no longer manufactured. I really loved the cinnamon cereal and I can't find it any where can you buy it off the main site or what can i do to get it. Please don't tell me you stopped making it that was a bad thing to do if you did. Bring it back - a lot of people miss it. I'm looking for the crunchy cereal low fat fruit granola that my husband got at work in a 3.9 oz container. Any ideas where to find it? I bought my granddaughter the Nature Valley cereal Crunchy Cinnamon, she loved it. But I haven't found it since. Where can I get more??? I have tried the Oats and Honey flavor and I thought it was fair. The flakes were pretty average and the granola pieces didn't really taste like the Nature Valley Granola Bars. They didn't have that same crunch or as strong of a honey taste. However, it's as good as most other cereals out there so I'd probably buy it again if I was in the mood for something with granola and flakes. I totally prefer this cereal with milk because of what it does to the granola bites :) I absolutely love the granola bits once they're soaking in a bit of milk - I find the flavor really comes out at that point. Big fan of this cereal! I actually buy the granola bites in 100 calorie packs and put it on other cereals. I've only tried the Oats 'N Honey flavor, but I really like this cereal. I didn't mind the texture of the granola pieces in milk at all and it tastes pretty darn good. I love this cereal. I am not a cereal eater, especially ones with flakes, but really enjoy this. And I DO like it with milk (I do try not to put in too much so it won't get soggy before eaten) and actually like how the granola pieces taste with the milk. I also like to add some dried cranberries and almonds to it. I think the Oats N Honey is by far the better flavor.